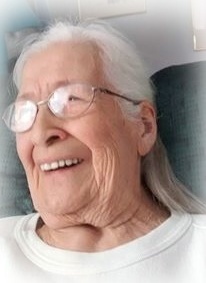 Louise Bain of Little Fort, BC, passed away on June 9, 2015, at Dr. Helmcken Memorial Hospital, Clearwater, BC. She was 83 years of age. Born in Vancouver, BC, on August 21, 1931, Louise has one brother left, Robert Allen Hanson, and one sister, Bernice Mildred Bain. She has one daughter, Margaret Helen Bain, and one son Daniel Charles Bain. Louise leaves behind many nieces, nephews, grandchildren, and great grandchildren. She was predeceased by her husband Alexander Charles “Chuck” Bain who died two years ago, and by her daughters Charlotte Louise Beale and Marie Inez Menzel. She was predeceased by her parents, Peter and Mary Hanson (nee Jeffries), as well as many other cherished family members. Louise met Chuck when she was about 20 years old, living at Tranquille. Chuck was a janitor there. Their first date was chaperoned! The first photo shows them hand in hand. They spent 61 years together as soul mates in marriage and continued to hold hands until the end. Although they had their share of ups and downs, they were good, honest and generous people. Louise is now reunited with Chuck. Louise has been described as a quiet and happy person. If people dropped in, Mom would ask if they had eaten. If the answer was “no”, Mom would say that they could always put another spud in the pot! Both Louise and Chuck lived by the belief that it didn’t matter what colour your skin was, that all people deserve respect and should be treated as we would like to be treated. Uncle Nels once commented that Louise’s world could be falling apart all around her, and she would always come up smiling! She inspired many people throughout her life. A Memorial Service for Irma Louise Bain took place at 2:00 p.m. on Saturday, June 20, 2015 at the Community Hall, Little Fort, BC. A pot luck reception followed in the hall. The service will be placed online in the next day or two, and condolences sent to the family via www.NTFuneral.com. Arrangements entrusted to North Thompson Funeral, Clearwater, BC, telephone 250-674-3030. To watch the memorial service for Mrs. Bain please click this link.